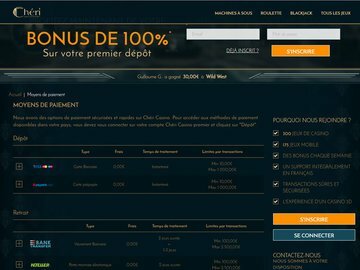 Below you will find a list of all the Cheri Casino bonuses - offered to new players. The right side offers a casino overview (click to scroll through the images). 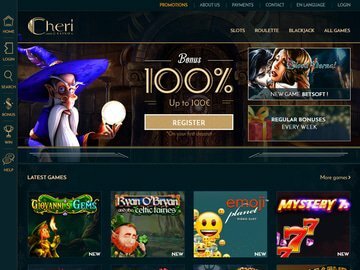 Cheri Casino is a brand new online gambling site that launched in April 2016. It is primarily targeted at the French market but is open to players from Canada, especially Francophones. The casino is operated by Fitzgerald Investment LTD and is licensed by the Government of the Dutch Antilles, Curacao. At present there are over 300 casino games and 175 mobile games and players can enjoy great bonuses every week. Support is available in English and French and there are some great 3D games to enjoy. This is a no download instant play casino and we are looking forward to seeing what they bring to the table. As mentioned, this is a brand new online gambling site so it is hard to say how Cheri Casino will do in Canada. The fact that they are targeting French players is a big plus and we expect a lot of signups from Quebec and other francophone territories. We will be interviewing the brand manager to follow up on things once the site has been launched for at least a month and will update this section accordingly. The Cheri casino bonus for all new players is a 100% match deposit bonus up to $100. This is a fairly standard offering for new sites but we would have loved to have seen them open with a no deposit or free spins offer. The wagering requirements for this welcome bonus is 35x the bonus and deposit and game contribution varies. Slots and keno contribute 100%, scratch cards 20%, and blackjack, roulette, poker, and video poker are excluded. There is no bonus code required to claim this welcome offer. Every Monday players can get a 40% match deposit up to $100 with wagering requirements only 20x deposit and bonus. Every Thursday from 6pm to Midnight is happy hour and players can get a 50% bonus up to $100. Again the wagering requirements are set at 20x. Every Saturday from 8pm to midnight there is a 45% bonus up to $100, and on Sundays players can get another 45% bonus up to $100. This means you can enjoy a great deposit offer nearly every day of the week and an instant boost to your bankroll. Additional bonuses will be added each month and having read the terms and conditions we know that free spins will definitely make an appearance. The T&C's state that there are no wagering requirements on free spins and that players can win up to a maximum of $400. On launch, Cheri Casino is offering over 300 casino games with more than 175 mobile games. These games come from a number of top software providers including BetSoft, Leander, MGA, NextGen Gaming, and Play'n Go. The site is also planning to add games from 1x2 Gaming, 2 By 2, Big Time Gaming, ELK, Cryptologic, Ainsworth, Genesis Gaming, iSoftBet, Lightning Box Games, Microgaming, Nektan, Playson, Quickspin, Rabcat, Thunderkick, and WagerMill in the coming months. All the games are available in no download instant play and players can choose the "play for fun" option to try them out risk free. The software is available in English and French only. You can choose games by selecting the software provider or the category. Categories include slots, blackjack, roulette, poker, video poker, keno, bingo, and others. There are 211 slots in total and popular titles include Heist, Tower Quest, Lost, Aztec Princess, Mad Pinatas, Fortune Teller, Little Red, and Photo Safari. There are 32 different variations of video poker and popular titles include Deuces Wild, Joker Poker, Bonus Poker, and Double Bonus Poker. These games are available in single and multi-hand variations. There are 12 different poker titles including Casino Stud poker, Pai Gow, Casino Hold'em, and Caribbean poker. There are 13 blackjack titles including Double Xposure, European blackjack, super 7, and blackjack pro Monte Carlo single hand. Rolettel fans can enjoy 10 variations including European, french, and American roulette. Cheri Casino also lists their latest winners and you can click on the Win section at the side of the casino at any time to see these results. When it comes to managing your account, you may be a little disappointed by the number of banking options available. Currently you can fund your account using Visa, Neteller, and PaysafeCard. There is no mention of Instadebit or eCheck. Withdrawals can be made via bank transfer and Neteller. The minimum deposit amount is $10 and the minimum withdrawal amount is $100. Withdrawals take from 1 to 3 working days. Deposit are made in Euro and there is no mention of CAD or any other currencies at present. Support is available via email and live chat from 10am to 10pm every day should you have any questions or concerns. There is also plenty of information available on the casino website. Support is available in English and French. Cheri casino is a brand new site for Canadian players and as such it has a lot to offer. 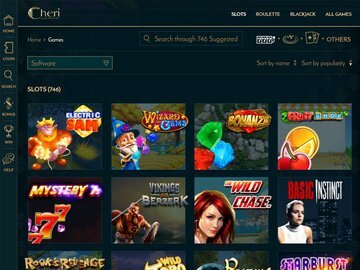 The Cheri casino bonus is 100% up to $100 and there are no free spins or no deposit bonuses available at present. The site is stylish and sophisticated looking and very easy to navigate. They are using a number of top software providers with more to come. They are licensed and regulated in Curacao and there is no need to download any software. There are over 175 mobile games for those who prefer gaming on the go, as well as more than 300 desktop games. A bonus code is not required to claim the welcome bonus and there are plenty of additional promotions too. In all, we recommend casino Cheri to all those looking for something new in 2016.